What a busy, busy week! Not only was the Ballymena Belles another huge success but the club performed well at Glenarm and Shane's Castle, a couple of mountains were conquered and there was action in places as far apart as Garvagh and Dublin! Ballymena Runners were well represented in Randalstown on Saturday morning for the 'Run Around The Castle' 10k/5k in support of Creggan Primary School. As the name and location suggests, this was an event held at Shane's Castle and one which produced a strong showing from the club athletes in attendance. In the 10k, Joseph McDowell finished 3rd overall (42:07), followed by John McClelland (4th; 42:41) and Linda Petticrew (10th; 46:03). Indeed, Linda finished second lady with Alison Foster (49:44) and Debbie Watters (51:14) also claiming places in the top five. 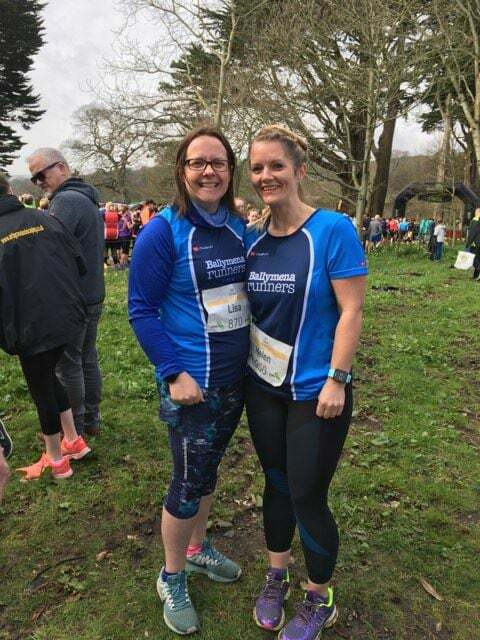 Other runners from the club included Sandy McDermott (48:00), Debbie McPherson (55:44), Chris Magill (51:27), Helena Moore (1:08:18), Jim Moore (51:15) and Sylvia Ringer (1:08:18) while Mairead Myles Davy completed the 5k in 30:56. The annual Hill and Dale series in the Mournes, organised by Newcastle AC, got underway on Thursday night with the McVeigh Classic in Castlewellan Forest Park, a 5.5 mile race climbing some 1080 feet - not one for the faint hearted! 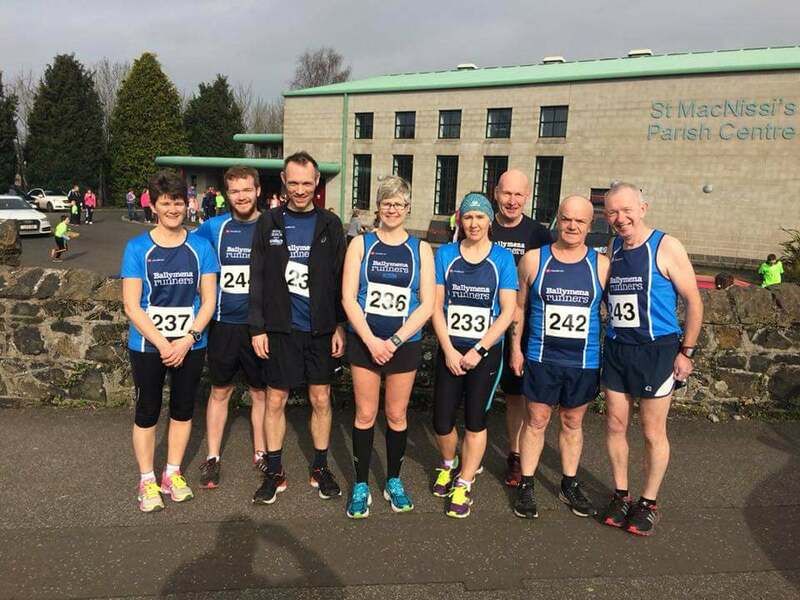 As expected, a number of Ballymena Runners headed south for the event wth Jonathan McCloy first of the club contingent to finish in 41:11 ahead of Alastair Donaghy (49:43) and Emma Donnelly (59:02), while Mairead Agnew and Adrian Dodds also competed. Almost 400 athletes descended upon Galgorm on Tuesday night for the annual club hosted Ballymena Belles 5-mile Road Race. The event overall was won by Gemma McDonald (Ballycastle Runners), just ahead of Ballymena Runners' Paula Worthington (32:30) and Tracey Atkinson from Albertville Harriers. In total, over 70 hometown runners competed in the increasingly popular race, now in its fifth year, with age category wins for Geraldine Quigley, Linda Petticrew and Brigid Quinn while Vicki Dunn, Sarah Woods and Susanna Allen claimed runners-up spots. 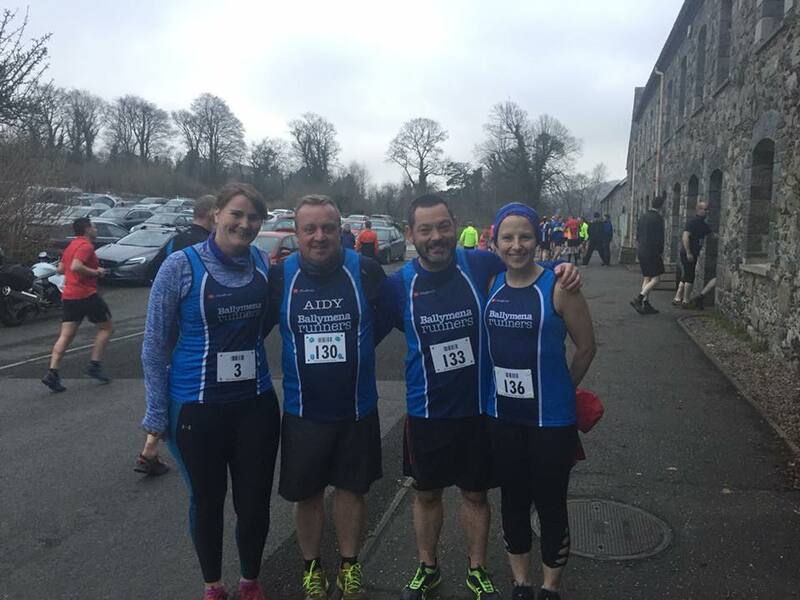 Glenarm Castle was the venue on Saturday morning for the inaugural Born2Run Challenge covering three different distances, namely 5k, 10k and Half Marathon. A total of 254 athletes tackled the undulating 13.1 miles challenge, including seven from Ballymena Runners with Alastair Hill first to complete in 1:47:33, ahead of John Hood (2:08:41) and Pamela Davis (2:12:30) who just pipped Moira McBride to the line by two seconds! Also taking on the half marathon route were Mairead Agnew, Aidy Dodds and Karen Hunter. Kieran Scullion produced a superb run to claim third spot overall in the 10k from a field of over 350 runners! Kieran crossed the line in 40:38, with Sinead Scullion (50:36) and David Scullion (50:57) making up the club top three. In addition, Lindsay Cunningham (1:14:07), Nigel Davidson (51:35), Nikki Hassan (1:05:58), Teresa Mark (1:05:57), Thamra Millar (58:53), Brigid Quinn (1:02:55), Sharon Speers (1:00:39) and Catherine Stewart (59:30) also ran the 6.2 mile course. Moving into the 5k, Michael Scott (26:02) and David Nicholson (26:58) claimed top 30 spots while Elaine Scullion recorded a time of 28:56 to be third club finisher. Also running were Donna Craig (34:03), Lisa Kirkwood (35:27), Gemma Moore (35:32), Amanda Scott (34:56) and Janice Wilkins (35:29). Top class mountain runners from all over the British Isles gathered in the Mournes on Saturday morning for the opening event of the 2018 British Fell Running Championships, the Highline Mountain Race. Covering 15.3km, climbing 1300m, starting at Spelga Dam and finishing in Newcastle's Donard Park the course challenged even the most experienced of athletes but, as usual, Ballymena Runners were not found wanting. Tim Lowry was first to finish in 2:18:43, followed by Mark Alexander (2:20:15), Gillian Wasson (2:26:08) and Ruth Aiken (3:02:35). Rodney Livingstone was the sole club representative at the Northern Velocity Garvagh Forest 21km Trail Race on Sunday morning, completed the three tough laps of the forest in 1:34:28 to claim a very credible 14th position overall. As if tackling the Mournes on Thursday night and Glenarm Castle on Saturday morning wasn't enough, Adrian Dodds made the long journey to Dublin on Sunday for the Great Ireland Run 10k around Phoenix Park, and recorded an impressive sub-60 time of 58:42 to boot!